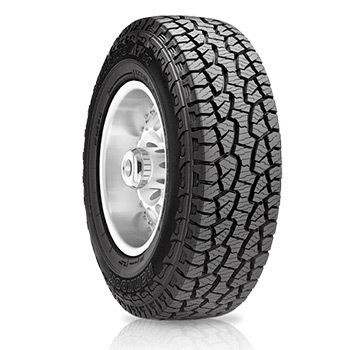 The Hankook DynaPro AT-m RF10 is an all-season, premium tyre. It is best suited for 4x4 vehicles and SUVs. Built to last, it is well loaded with all the necessary ingredients, such as tough pattern design, angling side grooves, thick sidewall rubber, jointless bead wire that make it a true off-roader. The reinforced under-tread gauge minimizes internal damage to the tyre when it rolls on rough roads. Not only on off roads, the performance of the tyre is also matchless even on inclined surfaces, thanks to the reinforced carcass which improves climbing ability and steering stability simultaneously. The DynaPro AT-m RF10 tyre gets zigzag block edges which lend excellent grip to the tyre in all weather conditions be it wet, icy or dry. Moreover, the wide tread ensures that the tyre gets maximum contact with the road alongside resisting uneven wear. The Hankook brand DynaPro AT-m RF10 tyres are the first choice of adventure-loving enthusiasts in the replacement tyre market in India. Presence of wave kerf ensures that the tyre gets two-step side sipes which extend tread life and enhances its performance on wet terrains. The stone ejector is a very practical feature of the Hankook DynaPro AT-m RF10 tyre that ensures no stone gets tucked in the center of the tread thereby presenting added safety and stability. Intelligently placed scallop grooves between the tread blocks increase traction when the tyre goes off the road. To tackle wet surfaces, the angled side grooves help the tread to self-clean along with adding traction on such grounds. Rim flange protector guards the rim against any accidental curb damage. For precise and confident cornering, it gets deep tiered side grooves which make the moving angle of the tread block smaller compared to the conventional tyres.